The molten CaO-based slags used in modern hot metal pretreatment and steelmaking convertors often contain a dispersed gas phase. This is called foaming slag and is created by refining reactions that utilize metallurgical lime. The rheological behavior of foaming slag, which significantly affects the fluid flow of processes associated with the dissolution of lime, has been found to be controlled by the dispersed fraction of the gas phase. In the present study, a simulated slag foam was produced by dispersing inert gas bubbles in various liquids. The effect of varying the volume fraction of the dispersed gas phase on the impedance was then systematically investigated with cylindrical configurations of electrodes. The following equivalent circuit analyses on the semicircular Nyquist plots indicated that electrodes with foaming slag consisted of a series circuit of the solution resistance, a parallel junction of the double layer capacitance, and the resistance of the electric charge transfer. 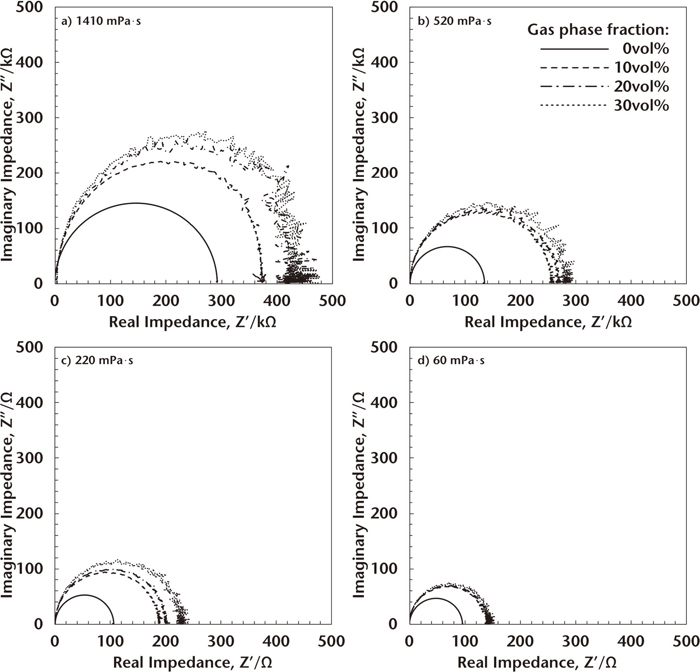 The Nyquist plots displayed semicircular shapes, and their diameters increased with the gas phase fraction despite the various viscosities of the liquid phases, which corresponded to the increase in the charge transfer resistance. The charge transfer resistances were calibrated on the basis of the increase in the electrode surface area and revealed a good linear relationship against the two-thirds power of the gas phase fraction in an ultrapure water and glycerol solution. This suggests a possible approach to quantitatively evaluating the gas phase fraction of a foaming slag by measuring the impedance.